BRAINWAVZ Delta with Mic l In-Ear Canal Headphones / please look at picture. 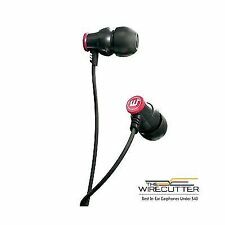 BRAINWAVZ Delta with Mic l In-Ear Canal Headphones / please look at picture.. Condition is New. Shipped with USPS First Class Package. Fostex T50RP Headband Headphones - Black W/ Brainwavz Angled Pads - Great condition! Condition is Used. Shipped with USPS Priority Mail. Includes original packaging and both 3.5 mm and 1/4” cables. Please note, the locking mechanism on the 3.5mm cable is chipped but the cable is still 100% fully functional. Brainwavz provides high-end earphones specifically designed for high-quality sound and tailor-made to provide the user with a solution that can be used across a wide range of audio genres and styles. A HENHJA headphone hanger. It is new with a open container excellent condition. Manufactured from high grade aluminium making the housing rugged and durable, perfect for on the go earphones. Astounding value for money sound performance. You won't find earphones with this high quality build, premium accessories and wonderful sound quality at this low price! 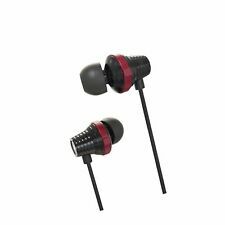 2-Brainwavz Delta Black IEM In Ear Earbuds Noise Isolating Earphones Remote. Condition is New. Shipped with USPS First Class Package. 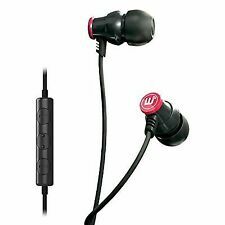 NEW Brainwavz M5 In Ear Noise Isolating Earphones Earbuds Black SEALED. Smaller than a headphone stand, sturdier than most other comparable desk headphone hangers. Fit Design In-Ear Canal. Our specialized fields are in rare Japan. In 2008 the year The Who had a. if your item had any problems such. We must work hard to solve. the problem and make it right. We promise to work hard on. We have for sale: Brainwavz HM5 Studio Monitor Headphones ONLY MISSING HEAD BAND. The large ear pads cover your ears to provide a seal that blocks out almost all outside noise, leaving your ears to hear your music only. As a plus for compact storage, the HM9 can also be folded up. Earbuds with balanced audio signature with overall smooth sound. Flat cable for less tangle and easy to wear. The cables are made with high purity OFC copper wiring at its core. Channel balance: =< 1dB (at 1000Hz). It has never been used and it was sent directly from Brainwavz. Brainwavz M5 Headset In Ear Noise Isolating Earphones (Black). The sound characteristics of our R3 are hard to find on almost any other in ear earphone. Uniquely positioned to be facing into each other, the resulting fusion and mixing of sound waves makes for a lush, detail rich sound that has a wide and open feeling that is normally only found on full size headphones and not on earphones. Microphone & Remote. iPods, iPhones, iPads, MP3 Players, Android, Tablets and Phones & Other Audio Devices. Velcro Cable Tie. 1 Shirt Clip. Included Accessories Plug: 3.5 mm, Gold plated. Cable: 1.2 m Y-Cord, Copper. Brainwavz Beta Headset & Remote- Earphones- Microphone- Audio-Call Control NEW ! Balanced Sound Signature. High quality sound reproduction. Silver OFC earphone cable with anti tangle features. Comfortable & secure fit. 12 Month Warranty. Brainwavz M100 IEM Noise Isolating Earphones with Remote & Microphone. Condition is New. Shipped with USPS First Class Package. The S1 use a flat cable and designed to be worn straight up for good sound isolation, they can be worn over the ear (left/right earbuds need to be used in opposite ears). No matter what style of music you listen to the S1 is suitable for any genre of music. Brainwavz M4 Noise Isolating Earphones. Condition is New. Shipped with USPS First Class Package. BRAINWAVZ S0 InEar Earbuds Noise Isolating Earphones - Brand New in Box!!! Only taken out of box once, includes all manuals and original packaging. Please feel free to contact me if you have any questions! 4 out of 5 stars - BRAINWAVZ S0 InEar Earbuds Noise Isolating Earphones - Brand New in Box!!! 4 product ratings4 product ratings - BRAINWAVZ S0 InEar Earbuds Noise Isolating Earphones - Brand New in Box!!! Brainwavz M4 are a dynamic driver based earphones which will take your ears to rock n' roll nirvana. The M4 have a sound that provides detail, depth and bass, giving a sharp and pleasurable sound. The sound signature is well suited for many song genres but most notably Rock, your AC/DC, GNR, Bon Jovi, Zeppelin and other rock god bands will, simply put, rock on the M4 with guitars and vocals well represented. FOR SALE: BRAINWAVZ KOEL. The Koel plays host to one of the finest drivers around and is tuned to produce a balanced and accurate sound signature, with little to no coloring. The Koel is a great introduction to the world of refined audio, now you get to re-discover and experience your favourite music all over again. jives by brainwavz earbuds NEW IN BOX - NEVER OPENED . Condition is New. Shipped with USPS Priority Mail. The Brainwavz B200 use the industry standardMMCX cables. Brainwavz B200 are unique in many ways, but one standout feature is how they are made. DUAL ARMATURE INSIDE. Drivers :Dual Balanced Armature. The Brainwavz Hengja is is a practical headphone desk hanger that is suitable for large or small headphones of almost any weight. The Hengja can be placed either horizontally surface (i.e. table top) or can be rotated with a hex key (not included) to fit on vertical surfaces (i.e. table leg). The over-the-ear design allows the R3 to sit comfortably and firmly, providing good noise isolation. The R3 housing is built from high grade, light weight aluminium. Transducers/Drivers: Dual Dynamic, 10mm. 24 Month hassle free Brainwavz warranty. These headphones are covered by Brainwavz comprensive hassle free warranty for 24 months. Designed to be noise isolating, passively blocking most outside ambient sound. ・ Corresponding to all genres, wide sound field and better bass. ・ High-to-low sound reproduction in good balance. Earbuds with balanced audio signature with smooth bass, a audiophile delight. Clearwavz remote designed to work on Apple iPhone iPad and iPod, crafted with high precision MEMS microphone for high clarity, people will be able to hear you clearly. All metal ear bud housing in a over the ear design with special finish to give a smooth, slick feel. Flat cable for less tangle and easy to wear. The cables are made with high purity OFC copper wiring at its core. Other included accessories: Comply T-400 foam tips included. 6 pairs of silicone tips, 1 pair of Bi and 1 pair Tri-flange tips, hard carrying case to protect your earphones. Driver Type Balanced Armature type. Fit Design In-Ear Canal. Our specialized fields are in rare Japan. In 2008 the year The Who had a. if your item had any problems such. We must work hard to solve. the problem and make it right. REFERENCE SEREIS HIGH GRADE ALL ROUND - From plug to earbud, the B200 have been with the highest quality parts - Braided high purity oxygen free copper cabling that's been constructed with AUDIOPHILE grade solder. They fit comfortably on your ear without distorting sound. Savor the notes with clarity and comfort. A good balance and clear vocal sound BRAINWAVZ "B100" is an earphone that fuses balanced sound quality and comfortable wear. Accessories: Earphone case (hard), silicon ear tip (2 pairs of SML each), compli yea tip T-100 (1 pair), shirt clip, cable tie. Good balance and clear vocal sound. Design in pursuit of lightweight and fit. Material: has just metal domestic landing, although description of item, etc. is English, you intuitively available. Warranty for one year, warranty time, please contact the dealer. Brainwavz in the company of up-and-coming to provide a variety of headphones / earphones, especially headphone stand, became a big hit of the top ranking regulars in the United States. It is now the most "hot" audio brand. TRUSS is, considering the ease and comfort of use, has been designed with 2-size headphones so as to be subjected to under the desk. "XFIT XF-200" is designed to ergonomically-friendly sport user. Accessories: Hard Case / cable tie / shirt clip / silicon earpiece (S / M / L) / · Comply S-400. Cable: 1.4m (Y type: oxygen-free copper) Plug: gold-plated stereo mini plug (3.5mm). ・ Accessory: ・ Hard case / ・ Shirt clip ・ ・ Silicon earpiece (S / M / L) / ・ Comply S-400. ・ Cable: 1.3 m (Y type: oxygen free copper) plug: gold plated stereo mini ・ plug (3.5 mm). ・ Frequency response: 20 Hz to 20 kHz Impedance: 16 ohms.